Looking at July 2013 has given a lot of insight into the overall Chicago foreclosure market, but what’s great about the statistics compiled by the Illinois Foreclosure Listing Service is the difference made by the details. Looking at July 2013 has given a lot of insight into the overall Chicago foreclosure market, but what’s great about the statistics compiled by the Illinois Foreclosure Listing Service is the difference made by the details. Now we’re going to readjust the sights and zoom in, exploring each individual county’s successes and failures in July. The county that has experienced the most change in properties sold to investors this month is Kendall County. Kendall, since July 2012, has experienced year over year growth of 1600 percent, which is extreme. This means that of the available properties at the auctions, Kendall has the best record of sales. From June 2013 to July 2013, it has grown 183.33 percent which was the biggest increase by a long shot when compared to the other 6 Chicagoland counties. Kendall County also had some surprising numbers when it came to new foreclosures on the market. Perhaps because of the seemingly high demand for Kendall County properties, the amount of new real estate is running low. In fact, Kendall County was the only county to see a decrease in new foreclosures this month, dropping by 4.44 percent in July. The scarcity of foreclosed properties in Kendall is further reflected in their REO numbers, which again were the only ones to decrease in July for the Chicago land area. Will County had some interesting numbers in July 2013, as well. Will had the second highest change from June’s numbers when it came to properties sold to investors. With 18 sold in June and 44 sold in July, the change was 144.44 percent. Unlike Kendall, however, Will County had an increase of 32.99 percent for new foreclosure properties coming onto the market, allowing it a better chance of keeping up with the recent buyer demand Chicago has seen this summer. Kane County went against the overarching trends in July with a 28.53 percent increase over June for new foreclosed properties, while their sales at auction were the worst of all the counties, with a 20 percent decrease from June. Still, Kane seems to have been the odd ball out in July, since the majority of the counties experienced more foreclosures and more investors snatching those foreclosures up than in the previous month or year. Cook and McHenry Counties stayed close together in their numbers for July. Cook saw 1,952 new foreclosures on the market in July, which is over 200 more properties than were foreclosed upon in June, resulting in a 16.12 percent change. McHenry had a similar jump in foreclosed properties with a change of 19.17 percent. Both counties also experienced more movement at the auctions. 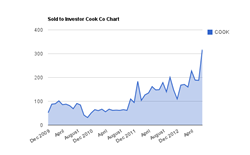 Cook County sold 317 properties to investors (or an additional 130 properties), creating a positive change of 68.62 percent while McHenry saw a change of 72.73 percent. For those looking to move to Lake County, there were 225 new foreclosed properties available in July, which was up from June's 185. But those were moving quickly at the auctions, since there was a 70 percent increase for the month in properties sold to investors, as well. DuPage County had very few new foreclosed properties come onto the market in July (only 7.53 percent more than June), which could mean it is one of the healthier counties to move into, or it could mean that there is simply less real estate available there. The number of properties sold to investors was low compared to the other counties, as well, though still up 17.65 percent from June. The Illinois Foreclosure Listing Service (ILFLS.com) is a Chicago-based subscription service that provides up-to-date data on foreclosure filings and related activities throughout the Chicago area, including Cook, DuPage, Lake, Will, McHenry, Kane and Kendall Counties. ILFLS recorders are assigned to every courthouse in the coverage area, which they visit daily to collect the latest data. ILFLS provides a searchable database and a broad array of productivity tools, all designed by and intended primarily for real estate professionals.